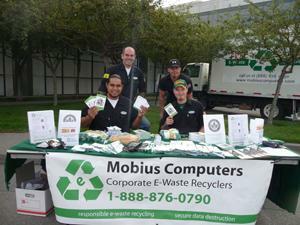 Mobius Computers provides secure data destruction and responsible electronic waste recycling for businesses throughout the San Francisco Bay area. We offer hard drive and data tape shredding to ensure that your valuable company, customer or patient data can never be recovered or stolen. Our state of the art shredder can handle up to 600 drives or data tapes per hour. We are a full service e-waste recycler dedicated to helping other businesses with their e-waste recycling needs. From free pickups at your office, to data destruciton, to the proper recycling of your equipment, we can handle it all. As a small family owned company, we can be flexilble to meet your needs. We have helped a huge variey of businesses since our founding in 2004. From small partnerships to corporations with thousands of employees. We have also worked with most industries including banking, biotech, legal, software, healthcare, manufacturing, publishing, and entertainment. Our goal is to properly handle and recycle all electronics in an environmentally conscious manner to ensure none of the hazardous material ends up in our landfill or is shipped overseas, but instead used as renewable resources in our technology dependent world.